All air brake systems have the same basic components. Learn the fundamentals here. The fundamental components consists of the compressor, the governor, air tanks, airlines, the brake pedal, and the foundation brakes. And the foundation brake can be one of four types. We'll be right back to talk about that. 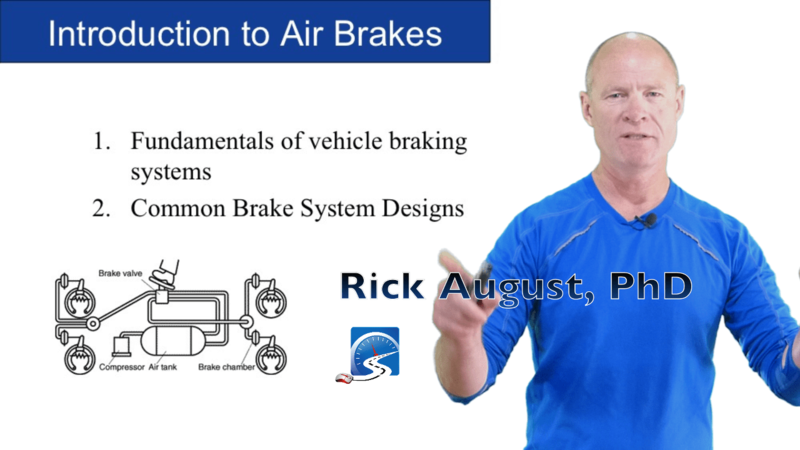 Hi there, Rick talking to you today about the fundamental component of an air brake system. The fundamental components are: compressor, governor, airlines, air tanks, brake pedal, and the foundation brakes. These are the fundamental components and by no means in this day in age are these the only components. We'll start with this and then as we go through the course we'll build on the different valves and components of an air brake system. And finally, by the end of the course you'll have an understanding of why in this day and age air brakes are bulletproof. This here, you can see is the fundamentals of a basic air brake system. This is obviously not what an air brake system looks like, but just to give you some idea of the fundamentals of the air brake system. You can see here, the first part that we need is‚ we need somehow to compress the air in the system‚Äîwe have an air compressor. The air compressor on air brake equipped vehicle is exactly the same as what you would find in a garage. The only difference between a compressor in a garage, and a compressor on an air brake system, is that the compressor on the air brake system - it runs all the time that the motor is on. So we need some way to control the amount of air that we put in the system. Because if we just keeping pumping air into the system, that compressor is capable of pumping up to 500 pounds per square inch. We don't need 500 pounds per square inch; we only need a maximum 135 pounds per square inch. So we have the governor - the governor controls the compressor. Think of the governor on a compressor like a thermostat on a furnace. The temperature in the house gets down to a minimum, the thermostat turns the furnace on; the temperature goes back up to a maximum the thermostat turns the furnace off. A governor does exactly the same thing. The system goes down to a minimum air pressure, it puts the compressor back into the load phase and loads the system. In Ontario and some other places they call it be "cut in;—system goes back up to maximum pressure‚ we know that it's a maximum pressure because the needles‚—the air gauge needle stop climbing and the system is between 105 and 135 pounds per square inch‚Äîat maximum pressure, the air that the compressor is generating is simply pumped into the atmosphere. We call it the "cut out" phase or the "unload phase." So the governor controls the compressor. We also have to have air tanks to store the air. This is one of the first fail-safe systems in any air brake equipped vehicle - air tanks. All of the air tanks on these air brake equipped vehicles are capable of holding 10 to 12 full brake applications. That volume of air - so if the compressor falls off the side of a vehicle for whatever reason‚ which it may or may not‚ there's enough air stored in those air tanks for ten to twelve full brake applications. On the air tank we need some way to prevent it from exploding or imploding - all tanks used in commercial uses - industrial uses - all have some sort of safety valve on them. This tank here, you can see the safety valve here. The safety valve is designed on an air brake system to evacuate air from the system at a hundred and fifty pounds per square inch. You as the driver will know that the safety valve is evacuating air from the system because they sound like a machine gun. If you hear that sound, you can authoritatively take the vehicle to your mechanic and say, "there's something wrong with the governor or the compressor!" Most likely the governor. As well, on the bottom of the tank here, you can see a drain valve. All tanks have to have drain valves. Most of them now are automatic or they have some sort of pull cord on them. The reason they have to have drain valves because when you compress the air you heat it up - it goes into the tanks. It cools and the water liquefies inside the tank because of the cooling process. Think of it like a drink in the summer time with ice cubes in it: the hot air comes into contact with the cold glass on the outside. The vapor... the liquid vapour inside the hot air cools and forms water droplets on the outside your glass. That's exactly what happens inside of an air tank. Also on the system we can see that we need airlines. The airlines harness and direct the air pressure into the system. As well we have a brake pedal. You can see the brake pedal here. Just push down on it - it's essentially a valve. Brakes on, brakes off. It's for the service brakes. There are two kinds of brakes on a big truck that's equipped with air brakes. 1) The service brakes and the 2) spring brakes. The spring brakes are primarily used for parking and in the event of an air loss, also for emergency brakes. But for this fundamental system these are the service brakes. The brakes that you use going up and down the road after you release the parking brakes. The brake pedal is also called the foot valve or the treadle valve, but for terms of simplicity we just call it the brake pedal. The brake pedal directs air out to the foundation brakes and the foundation brakes consist of the brake chamber, the pushrod, the slack adjuster, the 'S' cam, and the drum brakes. Air-over-hydraulic brakes and wedge brakes - you're not going to find them in this day and age. These pretty much became obsolete when gasoline engines were replaced by diesel engines. Gasoline engines created vacuum, which made air-over-hydraulic brakes plausible because they could use the vacuum from gasoline engine to power the master cylinder. Once diesel engines took over, they no longer created vacuum and it was no longer feasible to have air- over-hydraulics. So it was just the air-over- hydraulic became obsolete. And they went to a completely air brake system. Wedge brakes: in the twenty years that I've been teaching air brakes, I have only ever seen wedge brakes once, and that was on a trailer on the [Vancouver] island and it was kind of a novelty to take the students out and show them wedge brakes. The question on the test for wedge brakes is: they may have one or two brake chambers. That's the question on the test. As well, to identify a wedge brake, the brake chamber and the push rod will be facing into the brake assembly, as opposed to at a 90° degree angle as they are on drum brakes brakes. So the brake pedal directs air out to the foundation brakes. And as you can see in the image here it is a drum brake and that is the most common on large commercial vehicles at this juncture. Disc brakes are beginning to make inroads into the industry - not quite there yet. We'll talk to you about the review questions here. 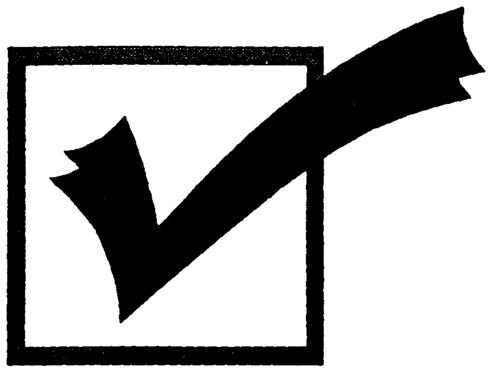 The review questions -shut the video off, answer the review questions and then turn the video back on and I'll go over the review questions with you. Second question: what is the purpose of the governor? The governor controls the compressor. The compressor runs the entire time that the motor is running, so we need some way to control the compressor, and the way that we do that is is that we unload it into the atmosphere or load it into the system and British Columbia and other provinces we call it the load phase - pumps air into the system, or the unload phase, where it pumps air into the atmosphere. In Ontario and other jurisdictions it's the cut-in or cut-out. So it cuts-in - pumps air into the system or cut-out and pumps air into the atmosphere. Third question: how are the air tanks the first fail-safe in an air brake system? The air tanks are the first fail-safe in the air brake system because they hold enough air for ten to twelve full brake applications if they are not replenished. So in other words, if the compressor falls off the side of the motor for whatever reason, there's enough air in the air tanks to make ten to twelve full brake applications. Question, what is the purpose of the drain valve? The purpose of the drain valve is to drain water from the air tank so they don't freeze up and cause damage to the air brake components. And other sludge and whatnot that is discharged from the compressor and just some of the dirt and sludge and what not. Question on the test: how often do you drain wet tanks? The answer to the question is: daily - every day. you drain the tanks on an air brake system. And the last question: what is the sound of the safety valve when it blows off at a hundred and fifty pounds per square inch. The sound is a machine gun. That is the sound of the safety valve blowing off excess air in the system because we have too much air you could cause damage to the system and potentially to yourself or other people around the vehicle. So all tanks used in industry and for commercial uses have a safety valve that blows off excess air or vacuum prevents the tank from either exploding or imploding is the purpose of the safety valve. PRACTICE AIR BRAKE QUESTIONS CAN BE FOUND HERE!